Lanark Way is the main street of South Four Corners. It's the only way to enter the neighborhood from Route 29 by car, foot, or bike (without crossing private property), and the it intersects with almost every other street in the neighborhood before ending at Renfrew Road.. On the northbound side of Colesville Road, adjacent to the Blair High School parking lot, there is a bus stop called "Colesville Road and Lanark Way" to serve transit riders from South Four Corners. The stop can be requested by customers on the Z2, Z6, or Z8 Metrobus routes and the 21 and 22 Ride On routes, all of which originate at the Silver Spring Metro Station. The northbound bus stop at Colesville Road and Lanark Way. Photo by the author. The problem with this bus stop is, despite it's name and location, the fact that it is over 1,000 feet from Lanark Way. How? That is the distance that South Four Corners bus riders must walk to legally cross Colesville Road before they even enter their neighborhood. I purchased these 1957 aerial images of the Four Corners area a while ago. I paired them up with current-day images from Google Earth to show what has changed since then. The contrast between 'then' and 'now' is very stark in some places, especially in areas disrupted by the Beltway. Viewers will also notice much wider roads like University Boulevard and Colesville Road are today than they were now. In 1957, only four travel lanes passed through the intersection. Today, the intersection hosts nineteen lanes and approximately 100,000 vehicles per day. For those wondering where I got these, they are from a website called historicaerials.com. While I had to pay for these images (which I only paid for because it wasn't expensive), there are several good free sources to obtain historic aerial and satellite photos. One of the best ones is the United States Geological Survey EarthExplorer, an online interface that allows users to select from dozens or even hundreds of images of any given place (I obtained the 1963 images featured in a blog post earlier this year from EarthExplorer). When looking for aerial images of a given year, always make sure no free option is availible before you buy some. Many websites charge for the exact same images that can be found for free on the USGS site. The intersection in 1957, a year or two before University Boulevard was split into a one-way pair and Colesville Road was widened to six lanes. 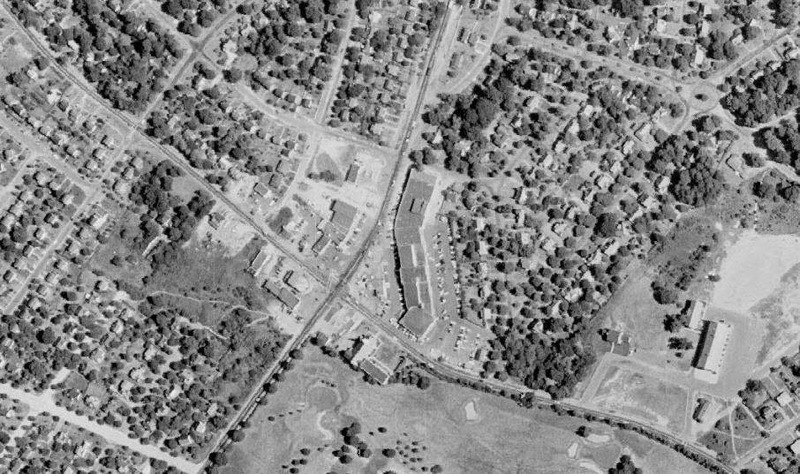 Note the country club property at bottom and Saint Bernadette's School (no permanent church yet) at right. It's been a while since I've posted, as I've been busy with schoolwork and finals. Blogging can be a lot of fun, but it also entails a significant amount of work (or at least it does to write well-researched quality posts). I'm back home on winter break now, so I'll be posting every few days as I did in the summer. I returned to Woodmoor during one of my favorite times of the year in Woodmoor: the Christmas season. While I'm not a fan of December weather, I enjoy this time of year because of the pride our community displays during the holidays. I can't think of any neighborhood in the D.C. area that decorates as much as we do, much less one with a decorating contest. A true hallmark of the Christmas season in Woodmoor is the lighting of Woodmoor Christmas Tree. The tree lighting is perhaps the most well known tradition in Woodmoor, and it has been a neighborhood tradition for over 60 years. Recently, however, there has been some debate about the future of the tree. The Woodmoor-Pinecrest Citizens Association has began a "save the tree fund" to pay for future lighting and maintenance of the tree, which stands in the middle of the traffic circle at Woodmoor Drive and Lexington Drive. A post on the Woodmoor Listserv about this fund generated some discussion about the tree and its history, present, and future.